Harvest Moon by Hand’s sponsor, UPrinting.com, is giving one lucky reader a pack of 50 custom thank you cards with envelopes, all for free! 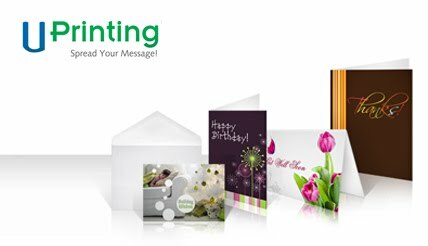 UPrinting cards are made from high-quality paper and cardstock and will surely bring holiday cheer to your friends and family. You can upload your own digital picture or use one of their images to create your own cards. For hosting the giveaway, I receive 50 thank you cards from UPrinting.com; and am so excited to be able to have cards printed with one of my favorite pictures. If you enter below, you have a chance to choose one of your pictures to have made into thank you cards as well. You could use these for your own use, to give someone as a gift this holiday season, or perhaps you want to create thank you cards for your business. Shipping: FREE UPS Ground Shipping in the U.S. Eligibility: Limited to U.S. residents due to shipping costs. UPrinting.com is hoping to negotiate better shipping rates soon. Register to Win By: November 14th. A winner will be chosen by Harvest Moon by Hand using random.com on November 15th and will be emailed that day. To enter Harvest Moon by Hand’s giveaway sponsored by UPrinting.com, please leave a comment below. Make sure you include your name and email so there’s a way to contact you if you win. Please leave each in a separate comment, as each comment is an entry. 1. Follow Harvest Moon by Hand’s blog (you may want to do this anyway to learn about upcoming giveaways). Leave a comment here letting Harvest Moon by Hand know you are a follower. If you are already a follower, leave a comment anyway, as each comment is an entry. 4. Follow Harvest Moon by Hand on Twitter. Comment back here with your Twitter link. Existing followers just leave your Twitter link here. 5. Post this giveaway on your Facebook page (put “Facebook” in your post below). 6. Become a Harvest Moon by Hand Facebook fan. Comment back here with your Facebook name. Existing fans just leave your Facebook name here. Hi, Ann. This is an exciting giveaway! I am following your blog and I'm also a Facebook fan (Kelly Barto). Hi, I'm now following you on Twitter and your blog. Already a facebook fan from what I could tell .Great giveaway ! oh i would love to win please please! I am now following your blog! Can't wait to see who the winner is! This is a great giveaway!! Thanks for allowing us to try to win these great items! I did perform each step and now I'm ready to WIN!!! ;-)Go UWIB TEAM!!! I have become a fan of your facebook page under Brenda Gonzalez-Kennedy! WOOHOO! Not sure how to post the twitter link to my tweet, but here is a copy and you can go to my page to check it out:naughtyandnice RT @harvestmoonMN Giveaway – 50 Custom Thank You Cards by UPrinting.com and Harvest Moon by Hand: http://bit.ly/sPD9YAnd if you want to return the favor of fanning my page on facebook, go to http://www.companies.to/naughtyandnicelingerieHope I win this awesome giveaway! What cool cards, I already follow and I'm in!! HI,Ann- here again to enter this giveaway!I am following your blog! JBird's Garden is a Facebook fan (Janiece McWilliams) and a blog follower.A great give-away. Thank you for the opportunity to win! Great giveaway-thank you for hosting it!I tweeted it too! I have begun following your blog in my blogger reading list. Hi – I'm following your blog and would love this prize!! Sounds fun!I'm following your blog now, I tweeted about it (http://twitter.com/ALineofHerOwn), I'm now following you on twitter, I posted about it on my facebook page, and I'm now following you on facebook (Debbie Covart). And I by telling you all of this I'm leaving a comment! Great giveaway! I would love to get some of these for my business!